Spacious light-filled rooms for two people decked out in Alpine style with pale wood furniture and parquet flooring. Equipped with every comfort – flat-screen TV, safe and free Wi-Fi – all the rooms except one have a balcony with a stunning view. The private bathroom has a bath or shower, toilet, bidet and hairdryer. Spacious light-filled rooms for three people decked out in Alpine style with pale wood furniture and parquet flooring. Equipped with every comfort – flat-screen TV, safe and free Wi-Fi – all the rooms except one have a balcony with a stunning view. The private bathroom has a bath or shower, toilet, bidet and hairdryer. 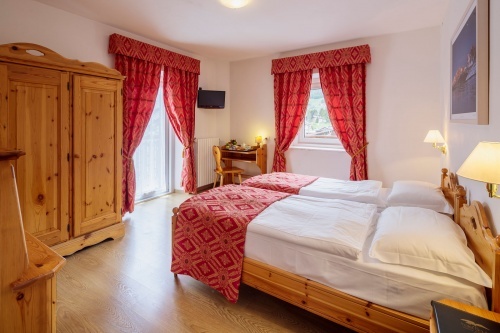 Ideal for family holidays, these mini-suites have two communicating rooms with Alpine-style pale wood furniture, plus a private bathroom with bath or shower, toilet, bidet and hairdryer. Equipped with every comfort – flat-screen TV, safe and free Wi-Fi – and a balcony with a stunning view.